This pattern is available for $1.99. Make your own fancy lace that calls to mind English gardens filled with lavender and tea roses without being so distracted with the construction of this shawl that you miss the key clue to solving whodunnit. Sizing: Size varies, gauge is not critical. 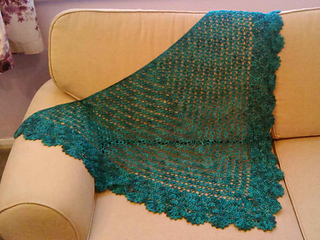 The sample shawl is 62” across x 36” deep. However, there are instructions included in the pattern for making the shawl larger/smaller by adding/subtracting rows. 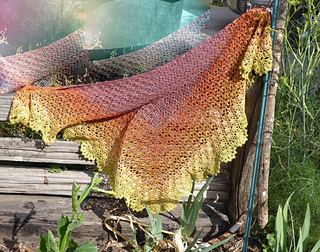 Yarn: Shawl uses 2 skeins of Alpaca with a Twist Fino or 1200 yds of similar laceweight/Size #0-1 yarn. However, you can use considerably less and make a scarf-size or use more for a shawl with more coverage. The pattern makes it easy to adjust sizes. scissors, stitch-marker, and blunt-tip needle. Pattern uses US terminology. Written and charted.